Well, I think it is needless to say that you chose a great song to learn, since you’re already here 🙂 Back in Black is an all time classic rock song, that is just amazing to play on your electric guitar under distortion. You'll be learning the song in detail with our electric guitar lesson, so lets have a look inside. This is a long guitar lesson, as the song is pretty long and moderately complex. It will give you a chance to practice a barrage of very important rock guitar techniques, and even if you don’t want to play in the style of Angus Young, you’ll still need to know these skills. You’ll be revising several basic guitar chords and learning some new ones, as well as a nice strumming technique where you strum and mute at the same instant, which will take some getting used to. You’ll also learn a couple of groovy riffs they play, which will really stretch your fingers and improve your lead guitar skills. So in summary, watch this lesson and practice this song, it’ll be really beneficial since it covers a wide array of rock guitar techniques you’ll need to know if you want to be a good guitarist. It’s not the easiest song there is, but with practice, you’ll be playing it just like Angus! 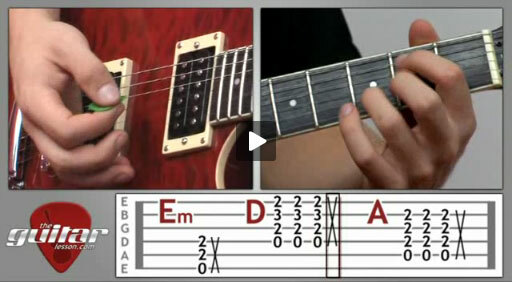 Have a look at some more of our guitar lessons for beginners as well. Back in Black by AC/DC was released on the album Back in Black in 1980. The acclaimed opening guitar riff was the band’s tribute to their deceased former singer, Bon Scott. The song was written by Angus Young and Malcolm Young. The song was covered by many musicians and used in a number of movies, including Ironman, Men in Black, etc. Billboard's Mainstream Rock Tracks: #51. Sorry, but you've reached a premium content area. The download of the Back in Black tablature file is only available to premium members. Sorry, the same goes for the backing track. To download the backing track to Back in Black, please log in and revisit this page.